The first vehicle based on Ford's new global Focus platform, the new C-MAX will drop cloth later this month at the Frankfurt Motor Show. But, you say, why should we care? Well, because we're told it may wash ashore here. The C-MAX, based on the iosis Max revealed at the Geneva Motor Show earlier this year is the first vehicle based on Ford's new Focus platform. Thus, expect the new global Focus to reflect the same design attitude and panache — but hopefully the new Focus will be more of a "dynamic passenger-car" rather than just exhibiting more of a "dynamic passenger-car look" as the C-MAX apparently does. But, why, you may ask, should you care about a Focus-based MPV in Europe? Probably because our sources tell us we may actually see the C-MAX — or some derivative — wash onto our shores. We're told we'll find out more in Frankfurt. Full press release in the gallery below. COLOGNE, Germany, September 4, 2009 – Ford of Europe has released the first official images of the all-new Ford C-MAX, which will make its global debut at the 2009 Frankfurt Motor Show. The show opens to the public between September 17 and 27, 2009. The new Ford C-MAX takes its design cues from the stunning iosis MAX concept car unveiled at this year's Geneva Motor Show, and brings new levels of style and desirability to the compact multi-activity vehicle (MAV) market. Departing from usual MAV thinking by using Ford's 'kinetic design' styling language to adopt a more dynamic passenger-car look, the new model features a coupé-like, sweeping roofline while still retaining the established Ford C-MAX hallmarks of comfort, space, and practicality. The new Ford C-MAX will introduce a host of new technologies to the Ford range, including an all-new 1.6-litre Ford EcoBoost direct injection petrol engine and other advanced features to enhance convenience and safety such as semi-automatic parallel parking and a blind-spot detection system. The Ford C-MAX will be launched in the second half of 2010 and is the first in a new generation of global vehicles developed from Ford's new C-segment platform, scheduled for introduction over the next several years. 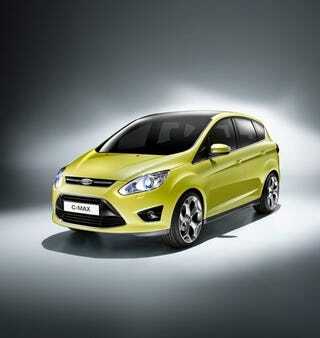 The global range will also include the all-new Ford Focus coming in late 2010. Further details about the new Ford C-MAX will be released at Ford's Frankfurt press conference at 11.00 hrs (CET) on 15 September.